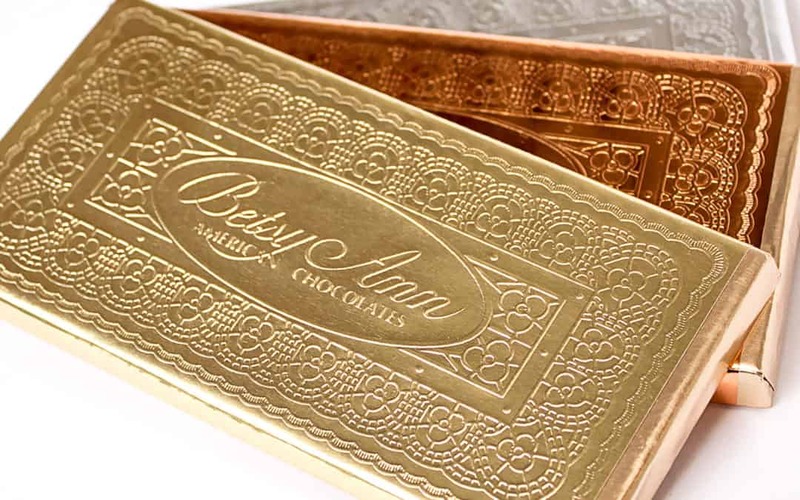 Did you know that Betsy Ann Chocolates will create customized wrappers on our chocolate bars for your special occasion or event? Our gourmet Chocolate Bars make wonderful goody bag or favors at Weddings, anniversary parties, bridal or baby showers, graduation parties, birthday parties, business events, trade show swag, and much more. We will customize the wrapper to your design or we can create one for you. We have three types of delectable chocolate bars to choose from: Milk Chocolate Gold Bar, Dark Chocolate Silver Bar, or Milk Chocolate Crisp Rice Bar. Find out more about our Customized Chocolate Bars or contact us to get a price quote and place an order.